The fushu 俘囚 and ifu 夷浮 were Emishi allies of the Yamato. The fushu, according to Nagaoka, consisted of settlers who had moved into the Tohoku region before the advent of the Yamato state and who brought Yayoi cultural practices. They were the various groups of Japanese speaking people who had come into the region from the south, introduced agriculture and created regional Kofun states. Initially these people resisted the Yamato, and may have been rival contemporary states, but those who became allies were called fushu. According to this view they were also known as den-I, which translates to "field barbarians" as opposed to san-I "mountain barbarians." Den-I were those "barbarians" who relied on rice cultivation for their subsistence. The fushu were used extensively in the Yamato campaigns against the Emishi. In fact, it could be argued that they were the primary reason why the Yamato eventually won. They used the method of "divide and conquer" to their maximum advantage, and the fushu and ifu were central to this policy. Once they were absorbed by the Yamato state the fushu were oppressed through a tax assessed on their crops, and corvee labor for government projects. The able bodied men were also drafted to serve in their armies. Some of them were also forced to move to the inner provinces and faced discrimination there. It was no wonder that throughout the two century campaign that the Yamato waged in the north many fushu rebelled or defected to the side of the I-teki (enemy "barbarians") to fight against the Japanese as in the case of Azamaro in the Thirty-Eight Year War. Whether they were the decisive element in the Emishi army is not known but their technology was close to their conquerors. There was an extensive trade network between Yamato controlled areas and the Emishi such that the arms deployed by the latter were not much different or slightly modified versions of what were used by the Yamato armies. They fielded horse-riding archers who fundamentally altered their conqueror's military culture. Therefore, the Emishi were made up of these settlers and their descendants, and also included the Jomon people living in the Tohoku. What is unclear is whether the two groups were allied, or were simply grouped together because both lived in the area. The distinction is made between the den-I Emishi and the san-I Emishi as the latter are called "mountain barbarians." The allied forces of these Emishi were known as ifu. That is, the Jomon people who submitted themselves to Yamato were known as ifu as opposed to fushu according to this interpretation. These are the Emishi mentioned in the T'ang histories, and are described by the Japanese envoy in the seventh century. A number of them are thought to have crossed the Tsugaru strait in the eighth century to settle in southern Hokkaido. These were the ancestors of the Ainu. Nagaoka's pairings of fushu/den-I and ifu/san-I is speculative because this distinction is not found in contemporary literature so tying these into the den-I/san-I pairing cannot be substantiated. To complicate matters, some of the Jomon who were Emishi adopted agriculture in the form of millet and barley and other grains for subsistence and were actual Tohoku natives who had lived there for millennia. His view about the Emishi as having been composed of separate ethnic groups is still the view of a number of scholars. Most recently, American scholars such as William Wayne Farris subscribed to the view that they were like other contemporary Japanese. Nagaoka’s study is broader than other scholars who have studied this issue. He looks at both the Kanto and the Tohoku and sees this northeastward movement of the Yamato state into the Tohoku as a continuation of its incorporation of the Kanto. He sees a continuation of the policy of assimilation of local groups from the Kanto to the Tohoku. Because of his emphasis on the continuity of the policy of bringing in local groups under the control of the state, be they regional kofun states founded by Japanese settlers or of indigenous Jomon villages, he tries to explain this by the pairing of fushu with Japanese settlers and ifu with indigenous Jomon. He overlooks the fact that there were important differences between these two regions and the way they reacted to Yamato authority. Curiously, in an archeological study from 2003 this view might be conditionally confirmed if we can confirm the identity of the burial tunnels located in Yamoto city (see Population of the Sendai Plain ). As that page shows if the burial tunnels are of the local gozoku Michishima Otate then we can confidently say that the latter was historically considered a fushu. This would confirm that the fushu label was generally applied to all local groups whether they were of local Japanese or local non-Japanese Jomon. Even were this true however, the pairing of den-I with fushu and san-I with ifu is still not substantiated, though the importance of defining fushu as both local Japanese settlers and local Jomon would go a long way towards settling the issue of the Emishi. Such a finding would be of great importance. In this archeological discovery the big finding from 2003 was not so much the burial tunnels which were already known, but rather the earthquake of 2003 that hit Yamoto city exposed burial tunnel 64 which was filled with the remains of Jomon locals from that time period. This is major because it shows the existence of this component population living in this area at this time though the relationship between these remains and the majority of non-Jomon remains found in the other burial tunnels is not known. Incorporating Hanihara's study (see The Emishi and Physical Anthropology) the fushu were not the same ethnically as the Jomon, but they were not the same as the Yayoi Japanese either--they were between both population types. The modification of this theory would be the pairing of this population type as the den-I and the Jomon as the san-I. In terms of the characterization of the groups involved more accurate. If this latter pairing is integrated it changes the perspective regarding the nature of the people who were known as fushu, namely, that the ethnic differences between them and the Jomon would not have been as sharp, and may explain their ethnic proximity. That is, the Japanese living in the region were closer ethnically to the Jomon than they are today. However, it still does not account for the language difference between them. What is known through various studies is that the Jomon component of the population was still strong in some areas of the Kanto as late as the end of the Kamakura period in the early fourteenth century. So much so, that C.Loring Brace, a well known American physical anthropologist, overstated the case with a very controversial theory that the samurai class was more related to the Ainu than to the Japanese. This was based on a sample of skeletons of samurai who were either killed or committed ritual suicide after the battle of Kamakura which ended the rule of the Hojo. This obviously demonstrates at least that Japan's population was not at all homogeneous during this time period, and many pockets (perhaps villages and local areas) still conserved older population traits. 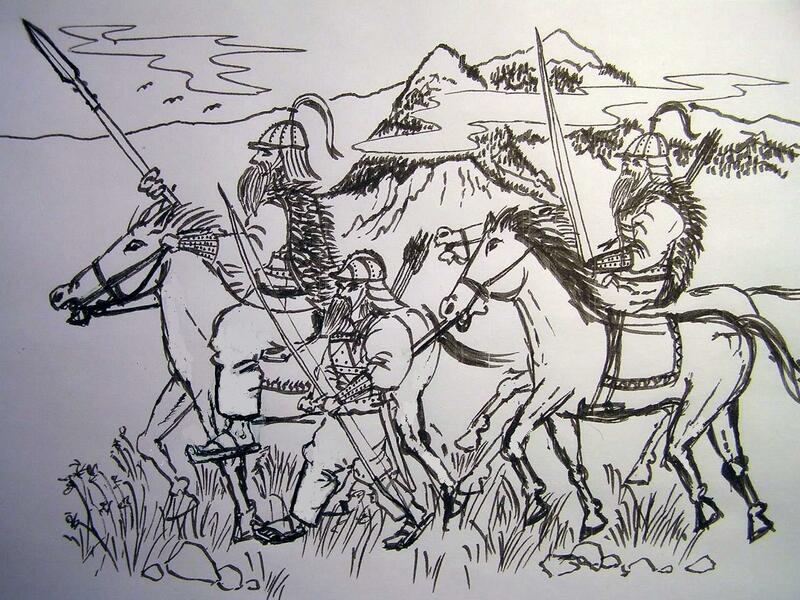 An Emishi raiding party in the Ou Mountains (right). The Emishi here are shown in iron tanko (and leather reinforced iron tanko) style breastplates. Aside from the iron helmet and tanko they are lightly armored, but highly mobile force that used hit and run tactics to maximum advantage. They also are shown here with bearskin cloaks for protection against the elements and for bedding (author's conjecture for use of bear skin--animal skin use (deer) is known from the Nihon Shoki). They are shown with their traditional bow shown here as being longer than most bows used by horse riding archers from the steppes of Asia and later adopted by the samurai. They are shown wearing traditional footwear (zo-ri) worn by Japanese throughout their history, and easily made locally. This footwear is applied to the Emishi here as I cannot imagine them wearing riding boots during raids and general geurilla operations as opposed to full scale military engagements as seen on the website's front page particularly during spring or summer. The central criticism of Nagaoka's view is that he does not account for language differences as well as why the Emishi faced discrimination. If as some scholars both in Japan and state side are correct that by and large the Emishi were ethnically similar to other contemporary Japanese then how do we account for the discrimination they faced, particularly as many den-I had adopted much of Kofun culture? There is ample evidence that discrimination was practiced against the fushu in the Tohoku who settled near fort settlements, and those who had been forcibly relocated to other parts of Japan. So despite the policy that Yamato actively sought in incorporating the "barbarian" as fushu they were still treated different from other Asian groups who came as refugees from Korea and China. It is quite simple: why were they called den-I "field barbarian?" Whenever the word “I” (as in "it") appears it always refers to people who were not part of civilized society as the Japanese defined it. The contemporary term I-teki in fact refers to barbarians who continued to cause problems in Akita which was one of the last areas of Emishi resistance (well into the ninth century) when they attacked Akita from Hokkaido. The attackers were definitely from areas inhabited by Ainu ancestors of the Satsumon. The biggest problem is language. If there was a significant Yayoi base that made up the fushu they would have certainly spoken a language similar to or the same as other contemporary Japanese, and not at all similar to the indigenous Jomon Emishi, and in fact contemporary sources speak of only lifestyle differences when making the distinction between ifu and fushu. However, this was not the case, as the Japanese used interpreters when speaking with the people. This aspect is why I believe that there may have been Kofun settlers who sided with the Emishi, but they had separated themselves long enough by several centuries from the Japanese to the point where their primary language was a Jomon language spoken by the Emishi of the area, and may have lost the ability to speak a Japanese related language. But did this actually happen? The jury is still out on this question and may never be answered conclusively, but one thing sticks out clearly: if the settlers made up the majority of the Emishi group then the language would have remained some kind of regional Japanese dialect even if it had changed over the centuries. However, if the language was Ainoid in character, a Jomon dialect, then it would mean that the Jomon were the majority and Japanese Kofun settlers a minority who had become part of the Emishi group. Recent findings (see Tohoku Kofun Population: sixth through eighth centuries AD page) indicate that in fact, it maybe the reverse, that the Kofun population was larger than the Jomon population among the Emishi of central Tohoku. This maybe regional, however, it has ramifications as to the nature of the Emishi group as a whole. The language question still remains however. In Ninno Naoyoshi's study we see that an incident at the beginning of what has been called Aterui's War, or the Thirty-Eight Years War, shows that the distinction between the two terms was about lifestyle. The most serious fighting between the government forces and the Emishi started as a private dispute between two officers employed by the Japanese army in 774, in other words fushu. Both were not just officers but also chiefs of separate Emishi groups. One chief, Michishima Otate called the other chief, Azamaro an ifu. This term was considered highly derogatory to an Emishi because among other things it implied that an ifu did not eat grain or rice, did not live in houses, and was generally an "un-civilized" backwards person, living a hunting and gathering lifestyle that the Japanese looked down upon. This may explain Azamaro's fatal hatred towards Otate. Some recent findings (above) suggest that one of these fushu Otate may not have been an Emishi of Jomon descent at all, but rather a local gozoku. Nagaoka's study frames the problem: how do we explain the early development of rice cultivation and Kofun culture and its spread into the Tohoku several centuries before the incorporation of the area into the Yamato state? Who were the people who created the kofun states in the Tohoku region? His solution was simple. The Japanese related Yayoi had moved into the region to create these states, and so lived side by side with the Jomon who were also contemporaries in the region, so when the Yamato state attacked, both the Yayoi settlers, den-I (field barbarians), and the Jomon san-I (mountain barbarians) fought against them. Naoyoshi's study sees the inconsistencies of seeing the den-I as mainly Yayoi settlers, added to the overall facts that don't seem to fit. Looking at the Emishi language difference as well as the discrimination they faced are serious problems for Nagaoka's view--they were both seen as "barbarians." Naoyoshi's view is that there were Jomon Emishi who practiced agriculture den-I and became fushu. Furthermore, the northern half of the Tohoku was re-incorporated into the Jomon orbit. That is, as I have indicated in other essays, in the northern half of the area a clear turn towards the Epi-Jomon culture took place as the population became more Jomon in character. Much of the conclusions about the Emishi and the fushu are based on later historical events in particular the eleventh century history of the Abe and Kiyowara clans who are arguably Japanese clans who moved into the Mutsu area (present day Iwate prefecture). The major problem with interpreting the Emishi using these clans is that the population in the entire Tohoku, except for the extreme northern tip, had changed considerably by the eleventh century. For example, large numbers of people were forcibly relocated from the Kanto into the area, and aboriginal Emishi were relocated to other parts of Japan. This took place after the final defeat of Aterui in A.D. 802. These massive re-settlements took place between 802 and 811. The number of Japanese re-settled numbered in the thousands. In the area of Kitakami river alone where the severest fighting took place four thousand people were brought into the area that became the six districts. By the eleventh century, two centuries after this event, the population of areas that used to be Emishi had become heavily Japanese. Much of our interpretation does not take into consideration of how much time had elapsed between the end of Emishi independence and the rise of the Abe and Kiyowara clans in Mutsu and Dewa provinces. The reason why this is so important to consider is that the Abe and Kiyowara were called fushu no tou or "fushu head" (meaning leader). They may have been called this in the eleventh century, but they were not equivalent to the Emishi of the ninth century. They were originally Japanese clans who moved to the area perhaps a couple centuries before their rise to power, and by the eleventh century were considered to be from the area, and perhaps some of their members had marriage ties with aboriginal Emishi clans, and so may have been able to legitimately claim partial Emishi descent, but even if true they were not that different historically from other settlers who had come in from the Kanto and lived side by side with the existing Emishi population. Farris, William Wayne. Heavenly Warriors: The Evolution of Japan's Military: 500-1300. Harvard: Harvard University press,1996. Hanihara, Waro. "Jinrui gaku ka ra mita Emishi." In Susumu Nakanishi ed., Emishi to wa Nanika. Tokyo: Kadokawa shoten, 1993. Nagaoka, Osamu. Kodai Togoku Monogatari. Tokyo: Kadokawa Shoten, 1986. Niino, Naoyoshi. "Emishi kuni no Jituzo" in Emishi no Sekai. Tokyo: Yamakawa, 1991. Takahashi, Takashi. Emishi no matsuei. Tokyo: Chukoshinsho, 1991.